Jessica Sepel is an Australian health blogger, nutritionist and wellness coach. Her road to healthy living was a long and winding one, and it’s a story millions of women can relate to. 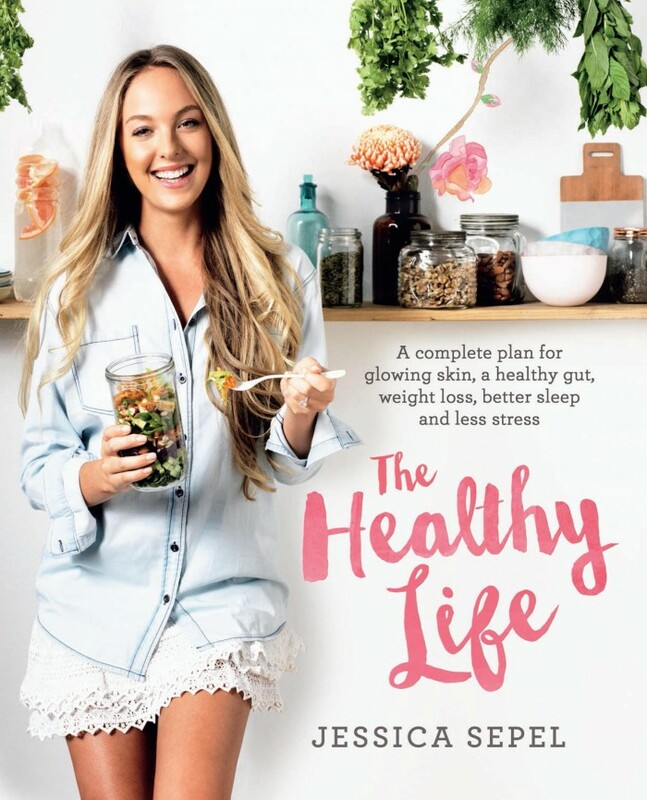 She recently published a book, “The Healthy Life” which is a curation of delicious quick and easy healthy recipes and a how-to on how to live a healthier lifestyle. We were lucky enough to interview her and share her inspiring story with all our FabuFit readers. As 2016 gets underway, we hope Sepel’s advice will inspire you further on your road to a happier, healthier and more fabulous you! FabuFit : The struggles you had with food is one that millions of women all over the world can relate to, what was the turning point for you? How did your journey to living a healthier life start? Jessica Sepel: Like so many young women, I spent my teenage years and early 20s struggling with negative body image. I tortured myself to the point that food was the enemy. It took time, but I realized that hating my body was impacting every aspect of my life. From that point on, I committed to understanding nutrition and how my body works. It shifted my mentality. I now view food as a source of nourishment. I ate in a way to heal my mind and body. It simply makes me feel the best I have ever felt. I wake up with so much energy and zest for life, and that is all because of my commitment to healthy living. FF: What were some of the first changes you made when you decided to lead a healthier life? JS: I started with my diet – back to basics by eating clean, wholefoods. Protein rich foods are very important when it comes to a stable mood (and stable blood sugars). Great sources include turkey, eggs, chicken, meat, legumes and white fish. Turkey, for example, contains tryptophan that helps to make serotonin. I had to learn not to be afraid of the good fats: avocado, coconut oil, nuts and seeds. Good fats help to balance mood (and the hormonal system in general). It is also important to avoid sugar rich foods, as they put us on a blood sugar rollercoaster, which will have a direct impact on your mood. FF: What are the biggest misconceptions about food and living a healthier lifestyle that you aim to dispel? FF: You have published a book “The Healthy Life” – it’s more than just another cookbook – why did you structure it more like a workbook/reference book. JS: Firstly, I wanted to give people recipes that don’t take hours to create. I don’t have time to slave away in the kitchen either, but I also want things to be healthy and delicious. A part of this was incorporating an educational component – teaching people the basics of the nutrition so that they know what their eating and why they’re eating it! FF: What are the key points you want people to walk away with having read and worked through your book? JS: A clean diet is key. This means unprocessed foods with lots and lots of greens, lean protein, and healthy fat from things like nuts, seeds, and oily fish. This is where we obtain most of the vitamins and minerals that are so vital for skin repair – and that coveted glow! So many things we eat contain just what we need for beautiful hair, too. For hair growth, silica is key – include lots of green leafy vegetables, cucumber, zucchini, mango, and beans. Zinc is equally important and can be found in things like eggs, pecans, Brazil nuts, and fresh oysters. Oily fish is another must for shiny hair! But take one step at a time! If you try to overhaul your diet at one time, you’ll get overwhelmed and frustrated! I generally recommend removing gluten for a trial period to see how you feel, and processed sugar is must to cut out! I think you’ll be amazed by how good you feel just with that simple switch. FF: For those who don’t have the book, what are some key points people can start adopting immediately to start making a change? FF: What is on the cards for 2016 for you? What can your followers look forward to? JS: A top secret project to be released this time next year (4th quarter 2016), writing my second book, the launch of The Healthy Life in the UK and (hopefully) the US – just to name a few!